The arbutus of the Pacific Northwest is a striking tree, never growing straight, and always with characteristic peeling bark. 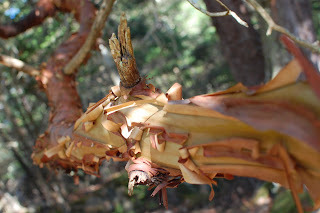 On a hike this weekend, I saw this arbutus, and heard it actively peeling away as I stood by it - a subtle crinkling sound, ongoing even without wind. I am working on germinating a few seeds, to try to add an arbutus to our garden.